Booking Mama: Review: Dinner Solved! Summary: Katie Workman is a gifted cook, a best friend in the kitchen, and a brilliant problem solver. Her Mom 100 Cookbook was named one of the Five Best Weeknight Cookbooks of the past 25 years by Cooking Light and earned praise from chefs like Ina Garten (“I love the recipes!”) and Bobby Flay (“Perfect . . . to help moms everywhere get delicious meals on the table.”). Now Katie turns her attention to the biggest problem that every family cook faces: how to make everyone at the table happy without turning into a short-order cook. Expanding on one of the most popular features of the first cookbook, her ingenious “Fork in the Road” recipe solution, which makes it so easy to turn one dish into two or more, Katie shows you how Asian Spareribs can start mild and sweet for less adventurous eaters—and then, in no time, become a zesty second version for spice lovers. She shakes up the usual chicken for dinner with Chicken Tikka Masala-ish—and feeds vegetarians, too, by offering a fork where cauliflower is used in place of the chicken. Fettuccine with Shrimp and Asparagus is a blueprint for seven other easy mix-and-match pasta dinner combinations. Crostini for breakfast—truly an aha! idea—can go sweet or savory, pleasing both types of morning eaters. Have all the ingredients on hand? Make the insanely delicious Chocolate Carrot Cake. Missing chocolate? Don’t run out to the store—the basic Carrot Cake is just as satisfying. I love Katie Workman! I met her a few years ago at BEA when her last cookbook THE MOM 100 COOKBOOK was coming out -- you can read my review here. I have followed her on Twitter and Facebook, and I loved the unique (and easy) recipes that she shares. 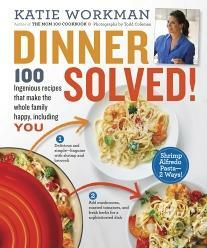 Her new cookbook is called DINNER SOLVED! and it's fantastic. It includes 100 recipes that should keep everyone in the family happy... even the cook. I have an extremely picky family that makes cooking meals a challenge. When you add to that the food allergies that my son has to eggs, dairy, peanuts, tree nuts, shellfish, soy protein, and sesame, it's not always fun to come up with meal ideas. I basically feel like I'm cooking the same five or six meals every few days. DINNER SOLVED! will help busy moms keep their families happy. Ms. Workman offers tons of recipes that are both simple and healthy. And then she includes what she calls a "Fork in the Road." A "Fork in the Road" shows very simple changes you can do to make the recipe more tailored to individual audiences. For example, many times she offers vegetarian options or different spice/heat options. Katie is a busy mom and knows what comes with cooking for a family. If kids can feel like they are helping the parents cook the meal, then they are more likely to eat it and try new things. In DINNER SOLVED!, Ms. Workman provides some help with what the children can do to help prepare the recipe. I'm horrible with letting the kids help in the kitchen because of the additional time and mess, but I know many moms will love this aspect of the cookbook. DINNER SOLVED! 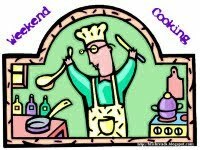 has a huge variety of recipes. There are twenty chapters and they pretty much cover almost anything you can think of. There are morning foods, appetizers, salads, soups and stews, various meats, pastas, one-dish meals, and even a variety of desserts. I truly believe that there is something for everyone in this cookbook. The cookbook has gorgeous color photographs for every recipe which is a must as far as I'm concerned for cookbooks. In addition, Ms. Workman does a wonderful job explaining the background of the recipes along with special food prep instructions. She even breaks the recipes into what you can do ahead of time and what has to be done last minute. I found many meals that I want to make over the next few weeks. While most of the recipes aren't exactly allergy-friendly for my son's allergies, I still managed to find quite a few to try. The first recipe that I tried was actually an appetizer for my book club. It's called Lemony Parmesan Artichoke Dip and it just happened to be vegetarian. I love hot artichoke dip but this recipe had a twist -- the lemon juice and lemon zest. It was easy to prepare and absolutely delicious. In fact, I had multiple people ask me for the recipe. It tasted so fresh and it was actually relatively low-fat because I used low fat cream cheese. DINNER SOLVED! is my new go-to cookbook. I love the healthy and simple recipes as well as the flexible options. Highly recommended! I love her "Fork in the Road" options! I was never good at letting Vance help in the kitchen either and I kind of regret it now. You know I love this book!